We’ve had a few nice nights here at home this last week. I took the chance to revisit the Moon with a pencil and paper. This sketch is of the terminator creeping over the Alpine Valley for a new Lunar day. Julius Caesar is just to the left of the valley, and Exodus & Aristoteles above the pointing rift. I found depicting the terminator quite a challenge. First, the shadows are just so dominatingly BLACK. In contrast, the highlights are so WHITE! Like the peaks that soar above the still blackened moonscape that capture the first rays of the sun, making them appear like floating, attendant pups of the Moon. It’s almost like the Moon is breaking up and pieces are falling off it. I found another challenge was finding the best balance of pencil grades to reproduce the shades of grey this time. The contrast is much more intense along the terminator. Tricky. Media: Pencil, white paint & ink on white paper. Location: my backyard in Sydney. 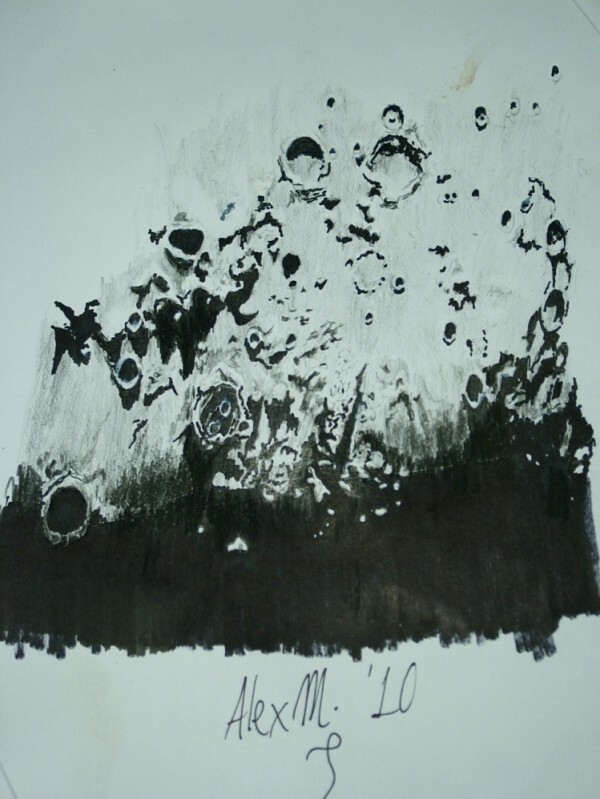 Very fine sketch of a challenging region of the moon to capture quickly. Absolutely stunning piece of work. Gorgeous; I love the button-hole crater. It’s cute! Thank you for your comments! They are certainly apperceiated and make the effort to post the sketch worthwihle. I realised I made a mistake with a crater name – Julius Caesar should read Cassini A!! Sorry about the mixup.